AKA John Glover Roberts, Jr. Clerk for William Rehnquist, 1980-81, and after that special assistant to US Attorney General William French Smith. Private practice, 1986-89 and 1993-2003, associate for Hogan & Hartson and partner from 1993 onward. In 2003, his gross income at Hogan was $1.04M. For 1989-93 he was Principal Deputy Solicitor General, responsible for arguing 32 cases in the US Supreme Court. As of his nomination, he served on the US Court of Appeals for District of Columbia Circuit. A conservative, though the paper trail on him is thin. He believes in a narrow interpretation of the Constitution and limited government. In one of his briefs he stated that "we continue to believe that Roe was wrongly decided and should be overruled" -- but in later confirmation testimony stated "Roe v. Wade is the settled law of the land... There's nothing in my personal views that would prevent me from fully and faithfully applying that precedent." George W. Bush nominated Roberts to replace Sandra Day O'Connor in a televised broadcast on 19 July 2005. 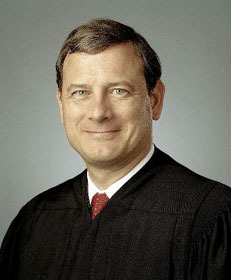 Roberts was sworn in on 29 September 2005. NNDB MAPPER Create a map starting with John G. Roberts, Jr.